"What?? ?....Oh no, it can't be..."
These thoughts immediately came to my mind after I first read on the Kimba Yahoo group that a dear friend of mine, Craig Andersen from KimbaWLion.com, passed away on October 22, 2012 of a heart attack. Although we never met in person (we lived very far from each other), he was a very good friend of mine and just like a family member. I wrote him the first e-mail in May 2000 after seeing his (then small) Kimba website, and he introduced me to the above mentioned Kimba group at Yahoo groups which he had also recently joined. Since then we've had many nice, long and deep e-mail conversations which were never limited just and simply to topics about Kimba, and he helped me many, many times with my Kimba website. We also made my first big and (so far) the only overseas exchange of rare Kimba items. He was a really good friend, always there to talk to and to help. It isn't overly to consider him the human equivalent of Kimba the White Lion, because he was just like him. Along with KimbaWLion.com (AKA Kimba.US), he was running the White Lion Shop, two other online shops (at printfection.com and cafepress.com) with Kimba T-Shirts and other items, the blog Intelligent Life is All Around Us (which was the "Kimba News" blog until January 2009), page about Christian the Lion (the real-life equivalent of Kimba), Westminster Gold.com and the Amazing3.US mini-site (folks, be sure to visit all of these sites, for you never know when they will be gone for good!). Also, in 1999 he reviewed some Dr. Demento-ish and some comedy records on houg.com (here is a photo from Anthrocon 2000 where he is seen with Eric Houg; here is another photo of Craig from the same event). What I know about him is that he was of Danish origin (his grandfather was from Denmark). His middle name was Gordon, and he was born on May 29, 1955. He also told me that during college he liked playing pinball (e.g. Bally pinball, like the 1972 "Nip-It") and watching the UK series Doctor in the House on TV. He discovered Kimba in 1976 unexpectedly - while checking how to connect his TV to his stereo, suddenly the part of the Kimba episode "A Human Friend" appeared on TV, to be exact the scene in which Kimba says "If only I could speak their language, I could make them understand". That scene has struck so much to him, thus entering him into the Kimba fandom. 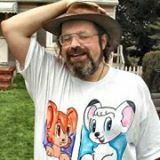 20 years later, when he first connected to the Internet on AOL, he used Kimba as his username to look for animal spirit guides. At first his username was "kimbawl" (and Kimba WL was the screen name, as seen here in one of his first Usenet posts dated January 1997) because "kimbawlion" was taken at that time, but in 1998 he managed to change it to "kimbawlion" after it finally became available. We both love big cats, but he was more than just a big cat (of both small and big cats) and animal lover - he always considered them as life forms with emotions and feelings like ours, instead of commonly considering them simply "biological machines". An example is the More Cat Language entry from his blog (he had a friendly encounters with a tiger at the Baltimore Zoo, while I had one with two friendly cheetahs at a private game ranch near Cape Town in South Africa). Simply put, he wanted to say that both humans and animals have "minds" and "hearts". He described it best on his Intelligent Life is All Around Us page (whose supplement is his Intelligent Life is All Around Us blog). In 1999 he has put on AOL his first Kimba page with his plea about the "lost" Kimba episode (which he managed to brilliantly restore and provide on his White Lion Shop in 2005), and since then the site grew and grew until it became a real "Kimbencyclopdia" that it still is. Along the Kimba site in 2001 Craig created the Kimba Preservation Society website, which covered all versions of Kimba before incorporating it into the KimbaWLion.com website. The Internet's most popular addresses regarding the little white lion, KimbaWLion.com and Kimba.US, were created in 2000 and in 2004, and Craig moved the website from the old AOL Hometown site to these new URLs soon afterwards. Around the time of opening KimbaWLion.com Craig joined the Kimba group at eGroups.com (now Yahoo! Groups) which gathered a small group of Kimba enthusiasts (which over time became the oldest and biggest gathering of Kimba fans worldwide) including Dwight Dutton, who was also the creator of the first Kimba-dedicated web server Kimba.org. Unfortunately, Mr. Dwight had to move on because of his real-life projects in 2001, and because of that he made Craig the moderator ("owner") of the Kimba group, after which the Kimba group spontaneously flourished into a big family of Kimba fans worldwide. Craig stepped down as the group's moderator in 2006 due to his own lack of time for it, but nevertheless stayed there and contributed to the group until his sudden death. In 2005 Craig opened WhiteLionRestorations.com, and on it he provided the DVD Kimba the White Lion - Little Kimba that he previously made using the original Japanese J.E.L. episode (for the video), and the sound track of the "lost" alternative 1st episode of Kimba (for the audio) which was recorded by a Kimba fan back in 1966 using a (for that time) advanced way of recording a TV show from the TV to the reel-to-reel audio tape recorder. A year later, disappointed with the quantity and quality of the 2003 "Leo the Lion" DVD by Palm Beach he managed to release a Leo the Lion DVD set of his own which was (and still is) superior to the 2003 release in both picture and sound, which featured uncut version of all 26 episodes of the series (here you can read an interview with Craig made by Tim Gadd from Keyframe in August 2006 on the occasion of the DVD's release). Along with all these DVDs of his own, Craig had put on his White Lion Shop the official Kimba/Leo DVDs, some rare items like the Kimba collectibles and the original cels from the episodes, and Christian the Lion DVDs and books. On November 10, 2005, accompanied by his wife Robin, Craig attended the 40th anniversary celebration of completion of dubbing of the first U.S. Kimba episode, on which all remaining members of the crew (incl. Fred Ladd, NBC project coordinator) were also present. What was interesting is that he managed to save the day by providing his DVD of the "lost" first episode of Kimba (which he brought with him) after the videotape with the first Kimba episode has jammed in the video projector, thus making it possible for the projection to continue (you can read about this on the report about the event written by Fred Patten, U.S. anime historian who originally wrote the "How Kimba Came To Be" which Craig brilliantly reworked and updated; the title "World's Greatest Kimba Fan" which I put as the subtitle was mentioned exactly in this report). It's also important to mention that Craig contributed to the 2005 Kimba DVD set in the way that he provided RightStuf the reworked article "How Kimba Came to Be" for the booklet, and the "Merchandise gallery" for the Extras DVD, for both of which he has been acknowledged in the booklet and the Extras DVD. Dear Craig, thank you for everything you have done for our beloved little white lion, for the entire Kimba fandom and the humans-animals connection! We miss you very much, and we surely always will! Also, here is the link to Craig's YouTube account.